As much as I love homemade granola, believe it or not, it’s not something I eat for breakfast. I am a savory breakfast girl through and through. Give me a poached egg or two over a mess of stir-fried greens, a sprinkle of coconut bacon (another thing I could just eat out of a jar!) and I’m a happy bunny. Granola for me is a snack. Something to nibble on out of a jar or tuck into if dinner was too early for my liking. A faintly sweet treat to enjoy with fresh berries and a dollop of yogurt. Inspired by my recent habit of sprinkling togarashi (Japanese 7-spice blend) over nearly everything, I thought I would introduce it to my other go-to flavour and nutrition booster, turmeric. I usually make my own togarashi, but while in Japan I picked up a few dinky, beautifully illustrated bottles and have been happily dusting everything from those morning poached eggs to cheese on toast, baked katsu tofu (recipe coming soon! ), popcorn and steamed greens. Togarashi, also known as Shichimi is a centuries’ old blend of ingredients that includes chilli, black sesame seed, white sesame seeds, dried orange peel, ginger, Sichuan pepper and dried seaweed. My own togarashi recipe is fairly traditional (here it is with some Japanese-style veggie tacos, complete with awful pictures!). The blend is used to flavour soups, noodles and rice dishes and to flavour tofu and rice crackers. And to make this quasi-granola. I call it granola because that’s how I have been using it, but really it is a punchy, more-ish seed and nut mix, imminently scoopable and incredibly delicious. You could make it more granola-ish by toasting honey and oil-coated oats and mixing into the contrasting savory seeds. 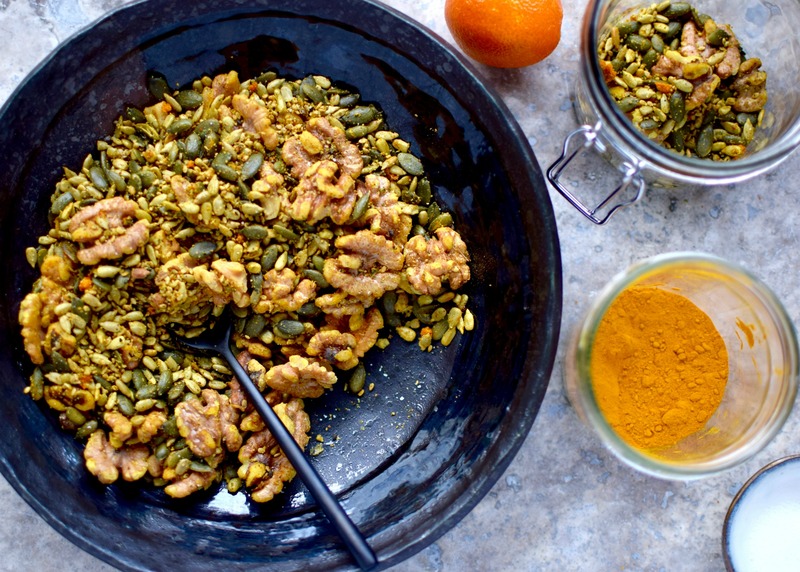 Indeed, I make a turmeric and maple granola for some of my nutrition and cancer classes (recipe coming one of these days!). But I recommend keeping it as is for versatility. **Method inspired by a recipe on 101cookbooks.com. 1. Preheat oven to 160C fan/ 180 C/ 350F. 2. Toss together the nuts, sunflower seeds, pumpkin seeds, oil, togarashi and orange zest and spread over a baking tray. Bake in the oven for 8 minutes. 3. While the seeds are toasting, grind together the turmeric, salt (if using), black pepper, hemp seeds and sesame seeds in a pestle and mortar until broken down and sticking together. 4. When the seeds have cooled ever so slightly, toss them with the spices and serve or cool and store in a glass jar. I love this post!! So helpful too. What a lovely seed mix! I would sprinkle this on EVERYTHING!